Miguel Zenon devotees: just go ahead now and pick up Oye! 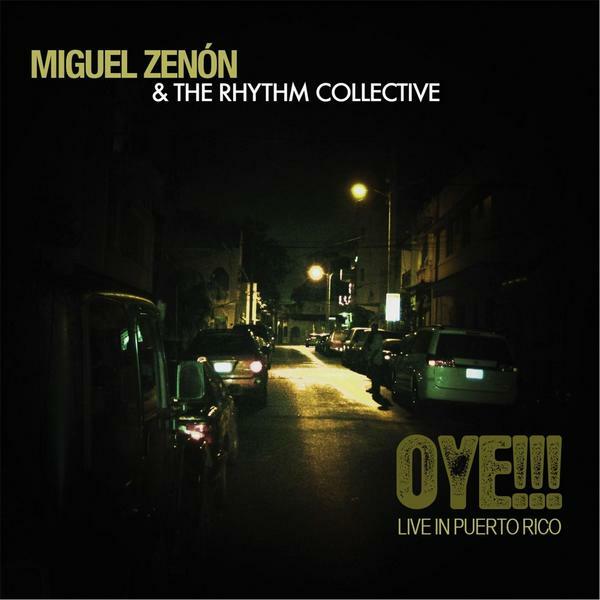 (Live in Puerto Rico) the new album from Zenon and the Rhythm Collective. Don’t even worry about the chance you won’t like it, because I’m sure you will. For jazz fans who aren’t familiar with Zenon: chances are you are going to really enjoy the album, as it is an infectious, captivating and scintillating live date which showcases one of the planet’s top alto players. Whereas Zenon’s previous albums have featured his amazing quartet, Oye! finds him in the company of electric bassist Aldemar Valentin, drummer Tony Escapa, and percussionist Reynaldo De Jesus. The Rhythm Collective formed in 2003 and went on a U.S. State Department sponsored tour of West Africa that year. As opposed to Zenon’s two previous albums, which explored Puerto Rican plena and the Puerto Rican popular song book, Oye! is not a concept album – it’s a more relaxed and slightly more spontaneous affair. Recorded in January, 2011 at the El Taller Cafe in Rio Pedras, Puerto Rico, the album opens with a lengthy cover of “Oye Como Va.” The group takes several minutes to get through the composition, which is representative of the group’s approach throughout the album – they don’t hurry anything. The way the group stretches out the structure and melodic and rhythmic elements of the tune forces the listener to consider the familiar song in new ways, making this reading much more than a simple cover. The strength of the rhythm section is immediately apparent throughout the tune, as it can switch up grooves, feels and textures on a dime – whether spurring Zenon on with pulsing and churning drums or giving a quieter and sparser vibe. De Jesus’ percussion solo at the end of the track is a highlight. The melody of “El Necio” is incredibly tuneful – fiery and pretty at the same time. Valentin opens with a probing bass solo before launching Zenon into one of the altoist’s trademarked impassioned and high soaring flights. Valentin follows Zenon with a second solo, backed by cymbals, shakers, claves and other percussion from Escapa and de Jesus before the restatement of the head. “Hypnotized” is one of the album’s more meditative cuts, reminding me of some of Trane’s later work in terms of how Zenon gets inside the spaces the rhythm section gives him. The album closes with “Double Edge,” on which the band absolutely throws down a scorching, high octane performance. The first three minutes finds the band in a cutthroat mode, before cooling things off. As the eleven minute track progresses it slowly builds up to a boil, drops down again, and then led by Valentin cranks right up again for a solo from de Jesus. “Double Edge” is straight nasty. Bottom line: regardless of whether you love Zenon, or are completely unfamiliar with him, Oye! is a super fun, grooving and killer album by a band that is able to entertain in a highly creative and musically rigorous way.